There’s plenty of activity in the NY/NJ area reacting to voters’ difficulties because of Super-Storm Sandy, including being displaced from their homes or otherwise unable to get to polling places. As always, the role of technology captured my attention. But first, the more important points. Some displaced people are having trouble even finding a place to shelter temporarily, so extra special kudos to those that manage to vote, whatever the method of voting they use. Likewise, extra praise for NJ and NY election officials putting in the extra extra-hours to be available to voters in advance of the election, inform them about changed polling places, and equip them to get the word out to their neighbors. The amount of effort on both sides is a great indicator of how seriously people take this most important form of civic activity. Next, the technology, and then the policy. On the technology front, Gov. Christie of NJ announced an emergency (and I hope temporary) form of voting for displaced voters: sending an absentee ballot via email. That’s a bad idea in the best of circumstances — for several reasons including the vulnerability of the email data in transit and at rest, and the control of the e-ballot by people who are not election officials — and these are not the best of circumstances. For example, I doubt that in every county elections office in NJ, somebody has a complete list of the people with access to the email server and the ability to view and modify data on it. But while you can see that Christie’s heart in the right place, there are several issues beyond these, as described in a NJ news report here. And this is only one of the emergency measures. In both NJ and NY people can cast a provisional ballot at any polling location — see NJ’s announcement here, and if you have the similar one for NY, please provide it as a comment! Finally, on the policy side, it’s not even clear what these ballots represent, and that’s the policy problem. My legal and policy colleagues here at TTV, and in the legal side of the election integrity community, certainly know more, but I don’t! Are the provisional ballots cast under these emergency rules required to be processed exactly the same as non-emergency provisional ballots? Are the e-mailed ballots provisional ballots or absentee ballots? If so, what serves as the affadavit? Do the email ballots have to be followed up with the paper hardcopy that the voter scanned and faxed? (The NJ Lt. Gov. office has issued some seemingly inconsistent statements on that.) If not, what happens in a recount? If so, why email the ballot at all, rather than just emailing a “my ballot is coming soon” message? I could go on and on, but I think you get the idea. The general issue is that in the case of a close election (most likely a local election, but state house or congress, you never know!) there will be some of these not-exactly-your-regular ballots involved, and the potential for real disputes — starting with concerns over dis-enfranchisement of people mis-informed about how to do a “displaced vote”, and going all the way to dispute about whether counted ballots should have been counted, and whether uncounted ballots should be counted. But let’s hope that it does not in fact get that messy in NY and NJ, and that every voter is able to make the extra efforts for their ballot to be cast and counted. … but rather using a middle way, between those large projects and the “download this PDF to fill out by hand” kind of support. The key here is to enable election officials to extend a major change in usability, while spending modest time and effort to quickly stand up an online voter registration assistance service. As I wrote earlier, we took the first step a few weeks ago when we went live with a new release of the “Rocky” OVR assistance system operated by RockTheVote and hosted by Open Source Labs. The main feature of the new release was a web services application programming interface (API) that provides other web applications with access to all of Rocky’s functions for voter registration assistance. Now it is time for me to connect the dots from there to actual benefit for voters and election officials — starting with an explanation of what the API is. If you take a test drive of “Rocky” you will see a human interface for people and their browsers to interact with Rocky. By contrast, the programming interface is for other web sites to interact with Rocky, or indeed any software including mobile apps and FaceBook apps. Another web site could implement its own separate human interface — different branding, different workflow — while a mobile app could assist the user by pulling information stored on the mobile device. But either way, the web site or mobile app does not need to have any back-end. Instead, they rely on Rocky for checking user data, constructing PDFs, storing registrant data, sending email reminders, and so forth. As a result, we’ve substantially lowered the cost in time and effort for any elections officials or NGOs to develop and deploy their own online-voter-assistance system, by opening up Rocky to be the back-end for these systems, so that all the complexity — and cost of deployment! — of the back-end functionality just drops out of these systems. No database to set up and manage, no computational heavy lifting. For organizations that already have a web site, it can be as simple as adding one or a few new forms pages, with a link to Rocky that will submit the voter’s registration information, and present back to the user the PDF with their completed form and mailing instructions. Any organization can use Rocky via the API in this way, including local elections offices that already have a Web site that they can update to use the Rocky API. And for local election officials in particular, there is an additional benefit. Via the API they can obtain a digital copy of the voter registration form data, and a tracking number. When the signed paper form arrives in the mail, they can type or scan in the bar-coded tracking number, and get the form data, so that they don’t have to retype all the information on the form — a time consuming (and in peak voter registration season, expensive) task with much scope for human error. There’s a lot to like about this approach, but it gets even better. In an upcoming release there will be even more features that will help organizations have the very own Rocky OVR system, but without having to have an existing web site that is easy to modify. Depending on how fancy an elections org wants to customize the look and feel, it could be a matter of a couple hours work to get up and running. Even better! More on that when the system is live. 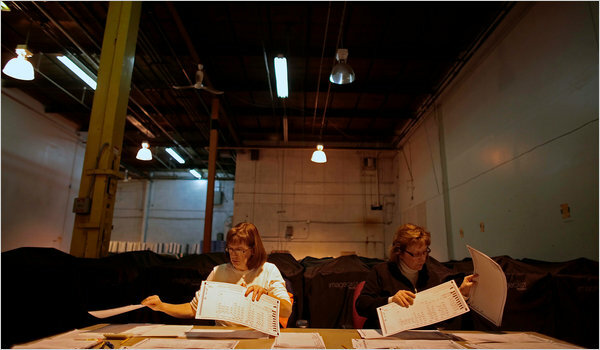 NY Times: Hanging Chad in New York? NYT reported on the continuing counting in some New York elections, with the control of the NY state house (and hence redistricting) hanging in the balance. The article is mostly apt, but the reference to “hanging chad” is not quite right. FL 2000’s hanging chad drama was mainly about the ridiculous extreme that FL went to in trying to regularize the hand re-counting rules for paper ballots, while each time a ballot was touched, the rule could change because the chad moved. Reginald A. LaFayette, the Democratic chairman of the Board of Elections in Westchester, said older poll workers had trouble reading the vote tallies printed out by the machines. “You take the average age of an inspector, it’s maybe about 65, and so you put a new product out with them, and the change has been overwhelming to some of them,” he said. It’s another example of the of situation I recently described in North Carolina. These voting systems were built for time-to-market, rather than designed, engineered, and tested for usability and reliability — much less designed for simplicity of the process of combining tallies into election results. The recent experience in New York is nothing truly new – but rather an example of the usability issues manifested in an election organization that, unlike those elsewhere using similar voting system products, has not yet learned by experience how to use these quirky systems with greater speed and transparency than the first time around. Of course, it is a shame that this type learning-by-doing in real elections is necessary at all, to get to a reasonably transparent election process. But that’s what the vendors served up the market, and that’s what TTV is working to improve on. I recommend you read Bruce Schneier’s perspectives on worst-case thinking, it’s quite interesting, and you will see his second and third reasons why we need to be careful with worst-case thinking. We’ve been spending a good chunk of our time lately on generating ballots, and on the steps leading up to ballot generation. You might think that the lead-up would be simple — making lists of contests and candidates — but actually there is lots more to it. In fact, it’s been much more time consuming so far than the initial development of open source software to do the actual generation of PDF files with candidate names, bubbles to fill in, and so forth. You might ask why, but there isn’t a short answer. Instead, what I can provide today is a pointer: some wiki material that first defines a bunch of terms, and then outlines the process of pulling together everything you need to start generating ballots. I think that it was quite a surprise to most of us that it took over 2 dozen definitions just for starters! And of course at this relatively early stage, the story is not inclusive of a huge variety of election administration practices nationwide — we have plenty of work to do with our stakeholders to refine and extend to where TrustTheVote “Election Event Management” module is broad enough to drive the Ballot Generator’s capability beyond this current example, to where all those various ballot items are done right for that wide variety of locales. Election officials in Myrtle Beach, SC, noted the absence of about 260 votes in the recent election there. Fortunately, the votes were found, and the reason for the error discovered — and both before the election was certified. It’s a good thing that Myrtle Beach election officials were making their lists and checking them twice, because it’s quite possible for the omission to have been overlooked until after the election was final. However, the story is a good illustration of how some technology design decisions create the scope for operator error. The electronic cartridge (PEB) is used to initialize the machine in the morning, enable the machine for voting before each voter, and close down the machine in the evening. In some jurisdictions, a polling place has multiple PEBs: a master PEB for opening and closing the polls, and another used for routine voting. When you do this, only the master PEB has the zero report and the vote totals on it. If you’ve got several iVotronics at the polling place, and you use a different PEB to close the polls on some of them, the master PEB won’t have all the totals; then, when you upload it, you’ll be missing votes from some machines. This is an excellent example of a procedural error of the type that the voting systems could help defend against, but don’t. It would be possible to write specs that lead to automatic detection of machines believed to have been deployed for which no totals have been reported. Sadly, we haven’t got such behavior in our system specs, and as a result, we chalk such problems up to human error and let the voting system off the hook. As you can see, once again the devil is in the details — and thanks to Doug for the infernal info. Arkansas E-Vote Flipping: Force 9 Gale? snafu might qualify as a force 9 gale. explain another reason why the U.S.